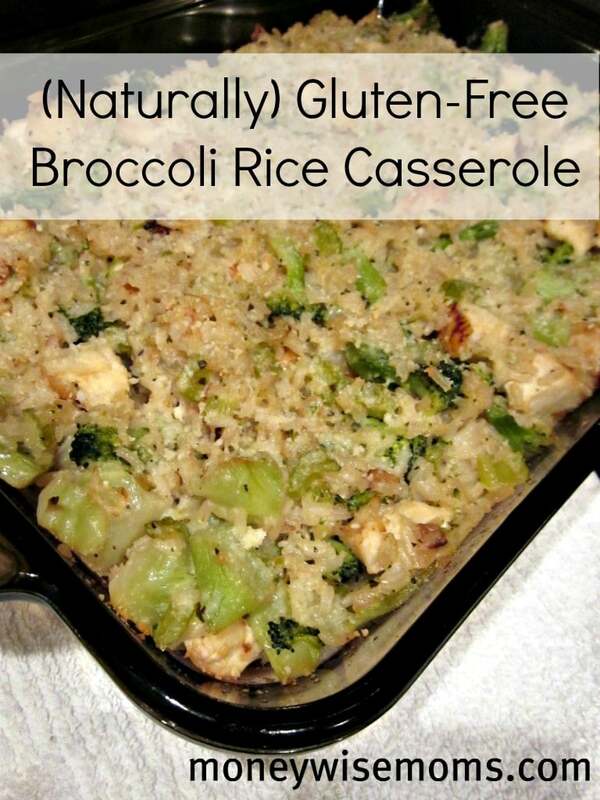 We keep this Broccoli Rice Casserole in the meal plan rotation all fall and winter. It’s one of our favorites! I’ve avoided making casseroles ever since I went gluten-free. I didn’t want to have to make homemade cream-of-whatever soup to replace the canned variety, since that seemed to take a lot of the convenience out of it. It is nice, though, to just make a big casserole and have lots of food for everyone, especially my children who seem to be on their umpteenth growing spurt. They love this meal, and we often have some leftovers for lunch another day. 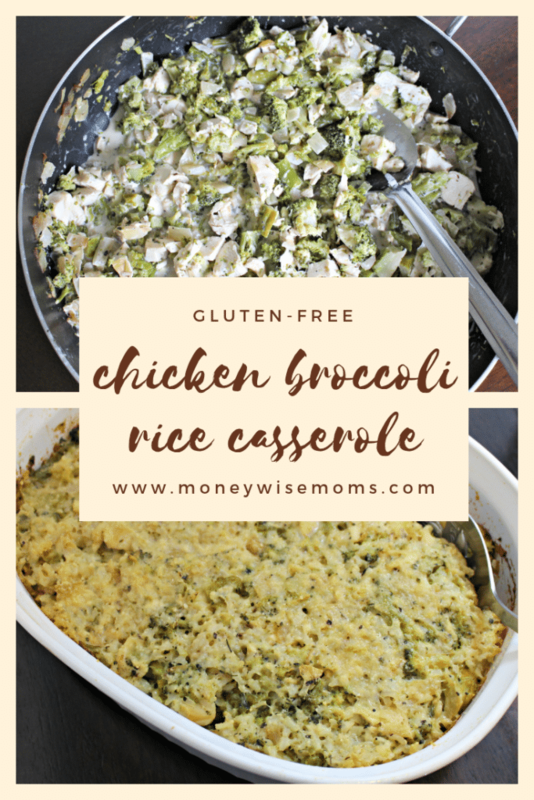 This gluten-free broccoli rice casserole can easily be made as a vegetarian meal, but I usually add cooked chicken to make it even heartier. Since I often have leftover chicken and rice in the fridge, this is quick to pull together and get into the oven for dinner. 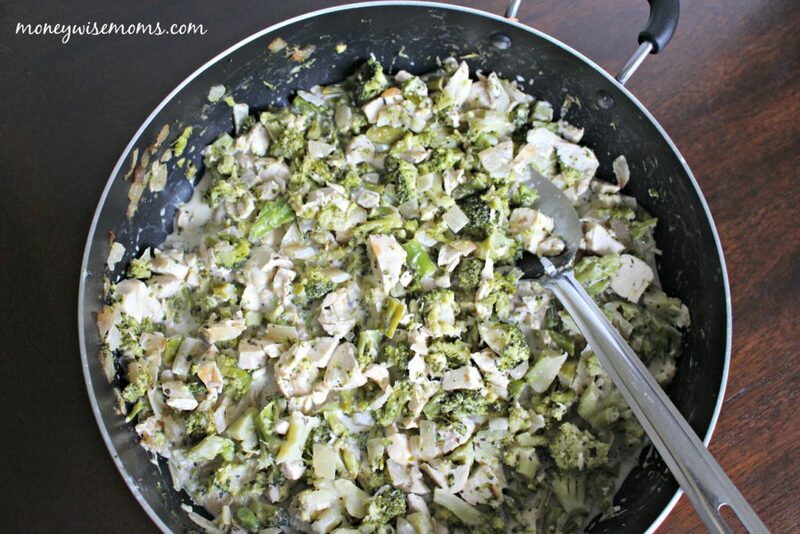 This Chicken Broccoli Rice Casserole comes together easily. While cooking the brown rice, I saute the chopped onion until translucent. 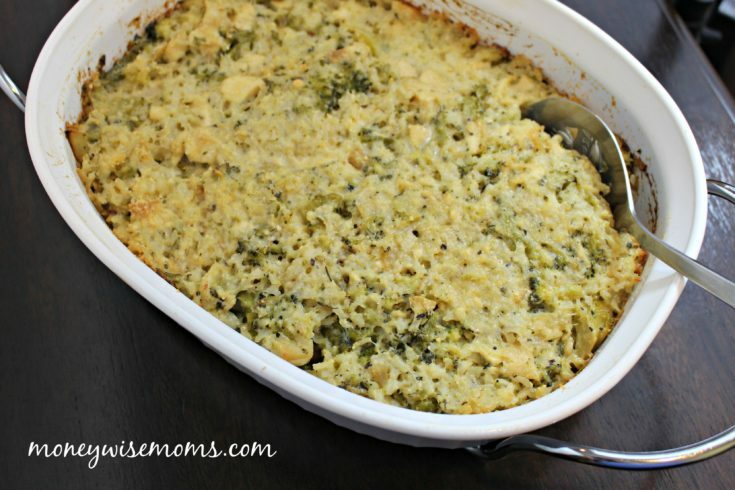 I use frozen broccoli cuts to make this casserole prep even easier. After defrosting in the microwave, I add the broccoli to the skillet just for a few minutes to make sure it’s heated through and softened. Then, I add the ingredient to make the replacement cream-of soup. Using chicken broth and cream cheese makes a creamy sauce that’s healthier and tastes so much better than what you buy in a can. Last, add the chopped cooked chicken and dried basil. Mix well. Then spread into a prepared casserole dish. I typically use a 9×12 glass dish or oval casserole. 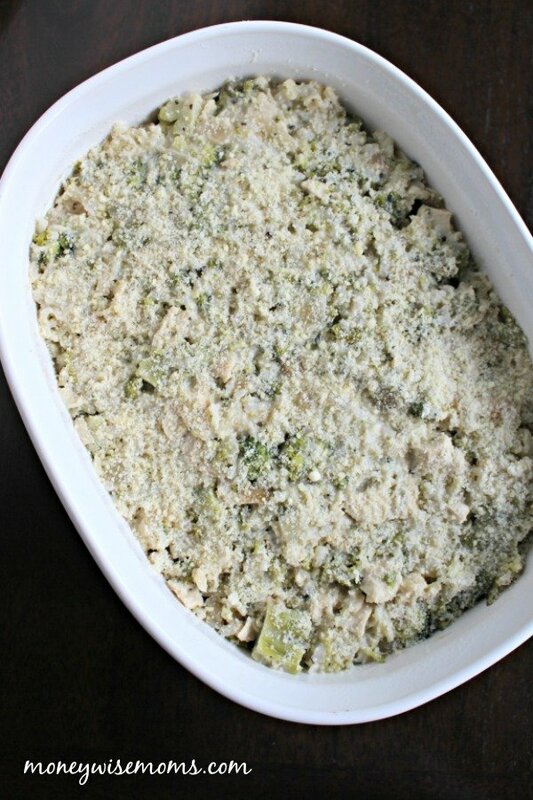 Sprinkle the Parmesan cheese across the top of the casserole, and bake in a 350-degree oven for 30-35 minutes. Does your family love casseroles as much as we do? Take a look at all the fabulous recipes I’ve collected on my Captivating Casseroles Pinterest board. I’ve been on WW Freestyle since March of 2017, so of course I’ve added this frequently-made meal to my app! 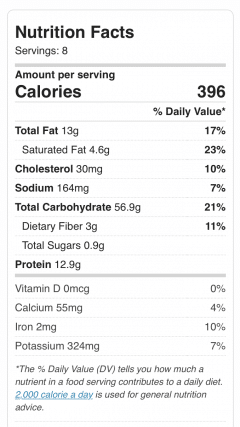 According to the app, each serving of Broccoli Rice Casserole (with or without the chicken) is 7 Freestyle points. Preheat oven to 350 degrees. Prepare a 9x12 baking dish with cooking spray. In a large skillet, heat the olive oil over medium-high heat. Saute the onion for about 7 minutes or until translucent. Add the broccoli and stir to combine, cooking until broccoli is tender. Add the cream cheese and water to the skillet, breaking up the cream cheese and stirring to make a creamy gravy that coats the vegetables. Stir in cooked chicken and season with salt and pepper. Add the rice and basil; toss to mix. Transfer to the casserole dish and sprinkle top with Parmesan cheese. 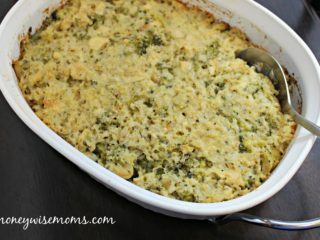 This Broccoli Rice Casserole recipe is linked up to Gluten-Free Wednesdays at Gluten-Free Homemaker, Friday Food at MomTrends and Tasty Tuesday at Balancing Beauty & Bedlam. I make a homemade cream soup base for all my casseroles – it is super easy and really doesn’t take but a minute. I would love your cream soup recipe–please send it my way!